Tattoo, or not to tattoo, that is the question. 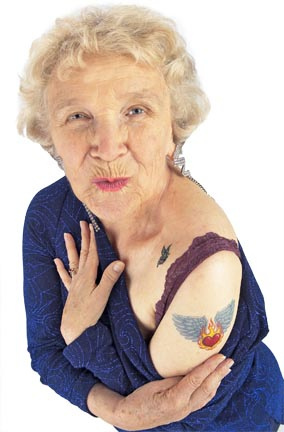 There seems to be a growing number of young men and women sporting large, obvious tattoos. I can’t understand why and certainly can’t be judgmental having one of my own. What I can do is testify to the fact that THEY DON’T AGE WELL! What you think might be cute now (though the size of the ones I’ve seen defy that description), look dramatically different thirty years later. They begin to resemble a Rorschach inkblot. Hard to imagine, but your body will not retain the shape or firmness of your youth. It is a fact of life, and it happens faster than you think. Among the myriad of poor choices I’ve made in life, the decision to get a tattoo is pretty close to the top. Luckily, that decision didn’t affect anyone else except maybe my husband who has to look at it every day. The image I chose brings it even higher on the list: a lion. What was I thinking? The obvious answer: I wasn’t! You will laugh when you hear why I chose a lion. I happened to be dating a Leo at the time. I suppose once I made the decision to brand myself, that seemed as good a choice as any, and at 18 seemed perfectly logical. If you saw my boyfriend, you would understand the tattoo decision more clearly, but that’s another story for another time. It must have been divine intervention that made me choose a size and spot that wouldn’t be visible publicly. I’ve always used it as an excuse for not wearing a bikini, even though the extra twenty pounds I’ve been lugging around all my life is the more noticeable explanation. Why does everything have to be so out in the open with this generation? Discretion is a wonderful thing. It adds mystery and allure. When you are walking down the aisle, you will probably want your guests noticing your dress without a glaring tattoo stealing center stage. When you are sitting in an interview, it is not going to work in your favor. When you are sitting on the PTA or on the soccer sidelines, it is not something you want front and center. Why? Because many people won’t look beyond it. That’s not right, but it’s a fact of life. And if there is any doubt that what you find fashionable and attractive today will be dramatically different as you age, just take a look at your parents’ yearbook photos! Or, depending on your age, maybe even your own. Now that I am older and hopefully wiser, I’ve adopted a “no sharps” policy. Simply put: nothing painful, nothing permanent. Meaning I will use any number of beauty or diet strategies, but will never again do anything permanent or use anything sharp on my body. No surgeries, needles, electrolysis, etc. Not even the sadistic practice of pouring hot wax on your body and ripping out unwanted hair. Who in their right mind invented that process? I think it must have been used as a method of torture at some point. Regarding physical appearance, a general policy of not doing anything that can’t be easily undone might be a prudent one. Anyway, if you are considering getting a tattoo, keep these images in mind as a guiding principle as to where you want it to be showing twenty years from now. Choose wisely!